By now, everyone has of course heard of the internet of things. The concept has been making headlines for years and will continue to do so as technology evolves and seeps into more and more items that now rely on connectivity. As we close out the first quarter of the year and look forward, it seems that most (exciting) technologies in the next decade will contain a semiconductor part, either incorporating Wi-Fi, low-power cellular or other low-power wide-area networking technology. A great deal of these chips will be able to combine energy harvesting capabilities and seamlessly self-charge, eliminating the need for an electrical source and battery. If and when this technology comes to fruition, it will forever revolutionize how the industry builds and manages software. 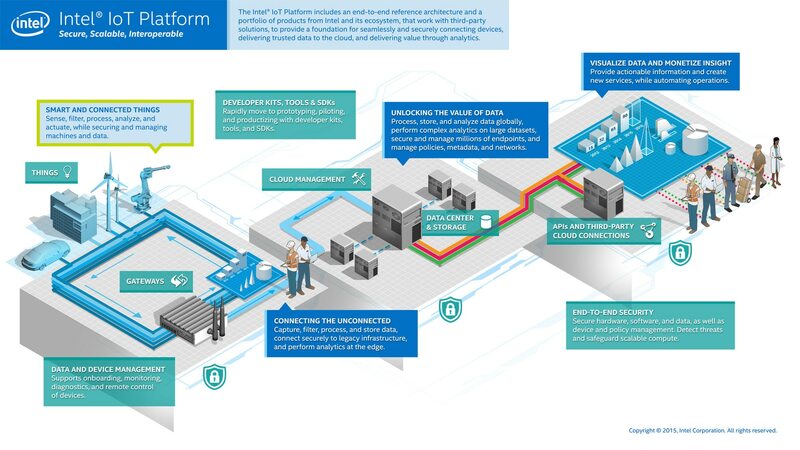 The overarching perspective is that we will move to a three-tier IoT architecture, with edge sensors connecting to intermediary aggregation points, which then connect to the data center or cloud. Distributed and elastic computing will also accelerate, as software and virtualization functions steadily characterize edge and aggregation devices. However, the chip industry is facing some roadblocks. The phenomenon that propelled computing innovation over the last half a century, Moore’s Law, seems to be decelerating as the investment needed to build new semiconductors on the latest leading-edge technologies is rising. On the other hand, it is extremely easy to outsource the design of lower-quality chips or hardware to contract manufacturers that use less-up-to-date processes — leading to extreme commoditization in many silicon and hardware segments. That said, many semiconductor companies outsource production of silicon components to contract manufacturers. In doing so, silicon companies are forced to hand over the secret ingredients in their product to the contractor, who produces and ships units of the product on the company’s behalf. This middleman frequently creates an immense, and often unmanaged, security threat for the hiring company. A very disturbing trend is emerging in contract manufacturing, placing intelligent device manufacturers at risk. Device manufacturers who outsource their manufacturing process to third parties may realize that some of those third-party manufacturing shops are overproducing the contracted-for device and selling the overage stock on the grey market for personal profit. It is clearly one of the biggest threats of contract manufacturing, because there is no control over how many of these production-run batches are being made, which could conceivably make their way to the grey markets. Hardware original equipment manufacturers catch contract manufacturers building a few extra runs of the latest, hot device and selling it to a pirate, or to someone who will slap their own logo on it. Fabless chip vendors face the same leakage problem with their contract manufacturing fab. IP vendors who have their product incorporated in a chip, but make money through collecting royalties paid by the final electronics OEM, suffer leakages from the first and second examples. The gnarly aspect of this is that grey market goods are not counterfeit! They are made to the original device manufacturer’s specification and are identical to the legitimate products. However, they are sold on the grey market at a fraction of the price and there is no way to distinguish a grey market good from the original — placing the true manufacturer’s brand at risk and profits in jeopardy. Thankfully as we dive deeper into 2017, manufacturers suffering from grey market abuse can look to the rising role software is playing to control, monetize and protect internet-connected devices. Increasingly IoT providers are leveraging software monetization technology to control their products’ features and functionality, rather than hardcoding that technology straight onto the device. Leveraging software licensing and entitlement management in this way gives manufacturers the flexibility, for example, to build multiple products and product versions by simply governing which features get turned on and off with software. These software monetization concepts can also be applied to solve the grey market problem. For instance, manufacturers can require that any new device make like E.T. and “call home” to a cloud-based license server to acquire an activation license so that the device becomes operational. If an illegally manufactured device tries to do this, it will not be granted a license and will not function. Using this strategy, device manufacturers may not be able to prevent the illegal manufacture of extra-contractual goods by a third-party manufacturer, but they can certainly prevent those devices from functioning. Another common approach is to add a software license during the manufacturing process. The device manufacturer can, for example, deliver a license for 10,000 devices. Once the 10,000 devices are made by the third-party manufacturer, they can no longer obtain licenses and are therefore unable to produce additional product. When the devices wake up, they check for a license before booting up — and will not operate if the 10,000 device licenses are surpassed. Software licensing can also be used to turn device features, and/or capacity, on and off as needed. In many cases, it is not the device itself, but the power of the software inside that makes the device valuable and attractive to consumers. Manufacturers and their official dealers or channels hold the keys to turn on capabilities, charge for those capabilities and, when the device is no longer needed, turn those capabilities off. Get smarter about how software licensing strategies can help their business — to foil grey market abuse and cultivate top-line business performance. While preventing overuse and abuse, software licensing strategies also help monetize the value manufacturers deliver through feature sets, services, volume/user thresholds and upgrade rights. Implement complete systems for accurately tracking and managing software entitlements (use rights and the terms of those rights). Purpose-built entitlement management systems are essential for decreasing operating costs, pinpointing upsell and renewal opportunities, gaining enhanced visibility into channel sales and cultivating overall insight into market dynamics. These best practices work in tandem to protect the device manufacturer and its performance metrics, as inadequate licensing policies could allow unauthorized resellers to profit off of devices bundled with software. The bottom line is that it is imperative for hardware device businesses to work intelligently and diligently to control, secure and monetize their devices and deter grey market production. Software monetization technologies can help design houses and IP vendors with SKU reduction, feature clipping/add-ons and revenue leakage. Technology pioneers in Silicon Valley are already putting these ideas into practice, and if you are watching, you will be sure to see more companies implement them throughout the rest of 2017.